How do you analyse NPS comments to improve your score? NPS is the statistic consolidation of all the customer feedback scores collected with the famous “how likely are you to recommend” question (detailed formula tocalculate NPS).Net promoter surveys are used by retailers to measure their customer loyalty (L’Occitan or Manutan for example) or by customer service to measure their customer satisfaction.While the net promoter score is a good KPI of customer satisfaction, it cannot be properly understood without analysing the verbatim associated to the NPS question. Why do you need to analyse NPS comments? Since its publication in 2003, the people in charge of the performance management of customer experience keep asking the same question: whats a good net promoter score ? And keep looking for NPS benchmark by industry. To create more promoters and fewer detractors is to apply one particular customer feedback best practices: look for your net promoter score meaning ! Stated otherwise: use the NPS comments to build and drive NPS action plan that will enhance your customers experience. the NPS comments can read in the context of a meaningful score that gives you an objective idea of your customer's state of mind. Therefore, if you really want to turn your NPS surveys into action plans, you must analyse verbatim from your customer feedbacks.How can you use net promoter score when you have a lot of volume (more than a thousand per month)? Do you have a lot of history or a lot of variables? You need to rely on some kind of natural language processing : text mining or sentiment analysis. What customer insights can I get from NPS survey responses? Once you have created a dataset with NPS metadata and you have imported open ended survey responses enriched with NPS scores, you can build net promoter score charts to get customer insight. There is actually a lot of possibilities and it would be impossible to talk about them all in this blog article so we will focus on three common use cases which will be detailed in other blog posts. Global NPS is not precise enough to guide decisions and measure the efficiency of action plans. Often you need a NPS for particular aspects of your business: services, prices, products… The most common way is to add NPS questions but it means longer surveys which is challenging when response rates to surveys keep dropping. Whether you have a good or a bad net promoter score, you certainly wondering : how to interpret my net promoter score ? Or even how to increase my nps score? Once again the answers are most likely in the NPS comments. You can measure the impact of main opinions, of all topics, on the net promoter score. One way is to measure how much the global net promoter score evolves when you neutralize an opinion or a topic. 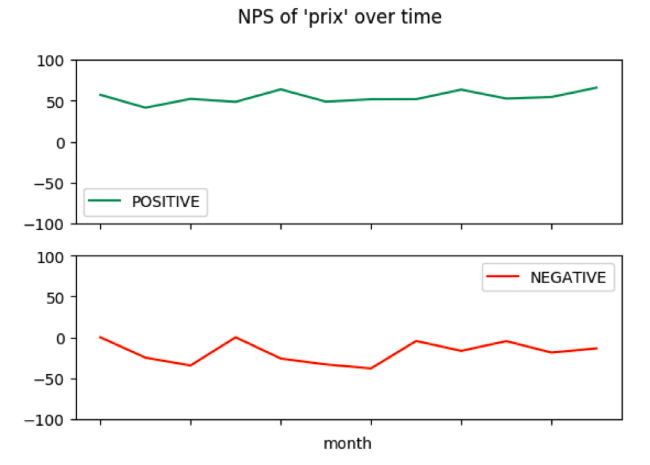 If the NPS increases, the opinion or topic has a negative impact. If the NPS decreases, the opinion or topic has a positive impact. The more it increases or decreases, the more impact (positive or negative) it has. Relative values are often more relevant than absolute values. NPS is no exception. While you may be wondering whats a good net promoter score, you should instead certainly consider how your NPS evolves over time. Whether it increases or decreases, you should look for explanations of those variations… and they most likely are in the NPS comments. With the proper solution, you can compute NPS subratings as a screenshot over a period but also as an evolution in time for each opinion expressed in customer feedbacks, for groups of opinions or for topics. To dig even deeper in the understanding of your net promoter score variations, you can visualize the evolution when it is discussed positively or negatively, which is one of the benefits of sentiment analysis.